As a society, we have forgotten how to become quiet, how to become still. We are always on the move, always busy, always doing. We’ve forgotten how to just be. This lack of silence pervades our lives. It’s in the moments filled with meaningless small talk about the weather to avoid simply sitting in silence. It’s in the moments on the subway, filling our ears with music, busying our minds with our phones, to avoid simply sitting in silence. As a yoga teacher and practitioner, I have seen it showing up in the form of teachers filling classes with an endless stream of cueing. 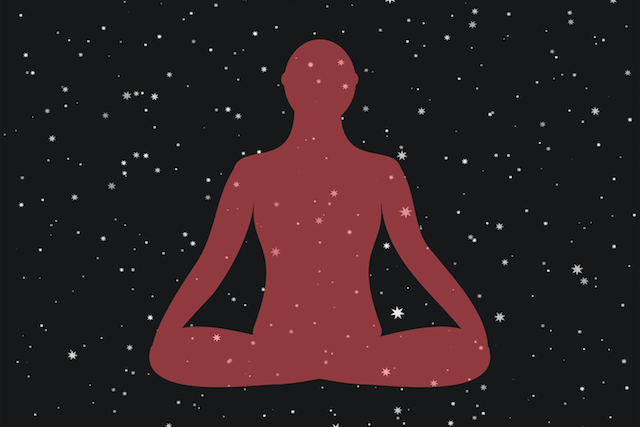 I have seen it showing up during savasana, the final resting pose, which gets cut short to avoid the anxiety of watching students fidget in the uncomfortable silence. To me, this is a tragedy. Silence creates space in our lives. It allows us to pause between moments, to process and reflect, to see beyond the surface into the depths of our lives. When we cut out silence, we cheat ourselves out of the fullness that life has to offer. Only in the silence can we truly hear the whispers coming from within us, urging us towards our highest potential. Silence breeds deep connection, not only to ourselves, but to the world around us. The energy of a silent room filled with people is almost palpable. In silence, we are all powerfully connected to our higher selves, to the universe, and to each other. For one moment at the spa, I felt this. Sitting in absolute silence in the sauna, silence brought a group of strangers together. We were all present, sharing the same moment, connecting with the world and not with our phones. It gave us space to turn inward, to take stock of our internal landscape, to let go of what no longer served us, and to renegotiate who and how we wanted to be in the world. Without silence, we keep moving forward, not really knowing where we are or where we want to go. I came away from that day of silence and quietude with a new awareness of what was happening in my life. In those moments of silence, I could hear my inner voice growing louder. Where it was once only a whisper, easy enough to ignore, it suddenly became deafening. After a day of silence, I had no other option but to face it. I went home that day and had a hard conversation. Potentially one of the hardest I’ve ever had. I realized that I hadn’t been honoring myself in my relationship because I had been afraid of losing something that I loved. My partner and I weren’t on the same page with what the relationship meant to us and what we wanted from it. Unintentionally, I lost pieces of myself to the relationship—by being the one to compromise, by being the one to follow, by being the one to give in. In this way, I put my relationship with myself last. I stopped cultivating things I loved that were separate from him, in order for us to spend time together. I didn’t go out of my way to make my own plans on the weekend. In the silence, I heard my inner voice becoming louder and clearer. I couldn’t go on feeling this way or being this way. The silence gave me the space to hear what my heart was saying and the strength to listen. Something had to change. I had to stop sacrificing my own needs and desires just to please someone else. I had to start standing up for myself and making it clear that what I wanted mattered too. I had to start making my own plans and doing things just for myself, and not always waiting to see if he had other plans in mind. I needed to be me, wholeheartedly me, first. It was scary to have that conversation, to feel like I might lose it all, by voicing what was in my heart. I was scared of what would happen if I stopped going along with it, if I started putting myself first. But I couldn’t avoid the conversation anymore. The silence roared. Perhaps that is why we avoid silence—because once you hear the voice in your heart calling out, you can’t ignore it. You can’t go on denying what’s in your heart once you create the space to hear it out. And that can be scary. Usually the voice within wants you to do the hard thing. The voice doesn’t want you to settle. It doesn’t want you to give up. It wants you to live to your highest potential. It wants you to climb mountains. It wants you to dream big and live big. And living that way isn’t always the easy thing. It’s not always the comfortable thing. Leaning into silence might seem scary. It might even be painful at first because your mind and body will fight it. But I urge you not to run from the silence any longer. Embrace it. Allow it to create space in your life, because it will transform your life. Ultimately, the silence pushed me farther into the life I dream of, into a life of passion, of meaning, of giving myself my best shot. The more time you spend in silence, the more powerfully it will impact your life, but diving straight into a ten-day silent retreat might not be the best approach. In fact, it might have the opposite effect. Instead, slowly introduce small pockets of silence into your day-to-day life. If you drive on your daily commute, try turning off the radio. If you take public transit, take out the headphones and put away the phone. Feel this silence and notice what’s happening around you and within you. 2. Set aside time for meditation. Block out a specific time in your day or week for a meditation practice. Perhaps it is first thing in the morning, or before you go to bed at night. Set a timer for five or ten minutes, sit or lie down with your eyes closed, and simply breathe. Watch your breath move in and out of your body. In the silence, I heard myself fighting against the ebbs and flows of life—holding on to expectations, worrying about how things might turn out, resisting where things were going. Sometimes our minds see silence as an opportunity to berate us with thoughts, thoughts about not being good enough, about missing out, about being in a hurry, about not having enough time. Our minds will be particularly active if we aren’t used to the silence. Your mind will fight the silence. A mantra can help you to quiet the mind and settle into the silence. 4. Use movement, such as yoga. If our minds are particularly active and we have a hard time just sitting in silence, we can start with gentle, mindful movement to ease ourselves into it. If we aren’t used to sitting in silence, our bodies can get very antsy. Silence can make us anxious. By using movement, we can soothe our nervous system and our minds, to make it easier to ease into a state of being. When I first got to the baths, I used a few neck and shoulder stretches to relax my body for stillness. This focus on the body in turn helped ease my mind into the silence. Embrace the lost art of silence. Your highest self will thank you. Kiara Elliott is a Pranalife Certified Yoga Teacher and aspiring workplace wellness health promoter. Her mat is her practice ground for making changes in her life. She loves sharing her passion for yoga and wellness with others so they can reach their fullest potential. She also loves reading and having coffee with friends. Check her out on Facebook here or Instagram (elliott_kiara).